2008: A Land Rover 'LRX' concept 4x4 started doing the rounds of motor shows, compact but up-market from the Land Rover Freelander. 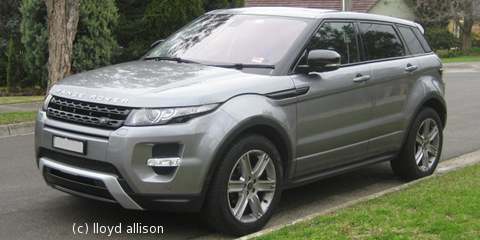 2010, May: It was announced that production would go ahead, as the Range Rover 'Evoque', in both 4x4 and 4x2 versions! Undisguised prototypes started tests in July. 2010, October: The Evoque made its official world debut at the Paris Motor Show, turbo-charged, 4-cylinder petrol and diesel engines, one of the latter claiming 58mpg and <130 gm CO2/km. The 5-door Evoque made its debut at the Los Angeles Auto Show, 17 November 2010. 2011: The Evoque on sale, ~July from £28K (2WD 148hp turbo-diesel 6-speed manual 5-door) to £44.3K ("Prestige" trim 187hp turbo-diesel 6-speed auto 3-door), and in .au $53,395 TD4 4×4, $57,395 SD4 4×4 2.2-litre I4 turbo-diesel, and $60,395 Si4 4×4 2-litre I4 turbo-petrol, in the "Pure"(!) 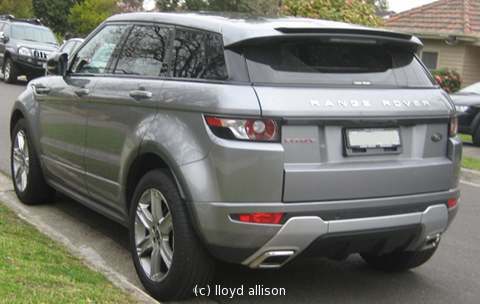 range, with the "Dynamic" range priced from au$66.9K to $73.9K, and "Prestige" from au$68.9K to $75.9K. 2015: The 2016MY Evoque got a face lift and two new "Ingenium" 2-litre diesels -- 148bhp or 177bhp. 2017 May 10: Land-Rover annouced that it had built 100,000 Evoques at Halewood since 2011.